WHOEVER adheres to the 5-star rating system for music reviews may need to begin to think again with the likes of Norwegian saxophonist Marius Neset and his contemporaries on the current jazz circuit! The last couple of years have seen Neset’s career advance rapidly, with everything he touches turning to gold. In 2011, he wowed jazz fans and critics alike with his Edition Records debut, ‘Golden Xplosion’, revealing an astounding mastery of composition and sax-playing, his distinctive ‘self-accompanied soloing’ technique leaving eyes and ears pleasantly smarting from his apparently inexhaustible displays of melody, pace and complex rhythm (and how dare he appear so cool, post-gig?!). It’s evident that Neset’s roots lie in the folksong and atmospheres of his homeland, imbuing both his playing and writing with contrasts – sometimes heady and exhilarating; then shifting to an other-worldly paradise, musically capturing vast landscapes and a sense of time standing still. His recent duo recording with tuba player, Daniel Herskedal (‘Neck of the Woods’) sumptuously revealed much of the latter. 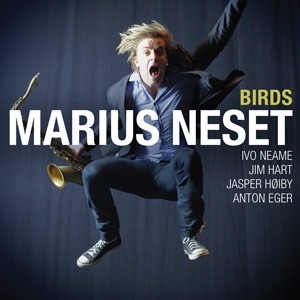 For his new release, ‘Birds’, Marius Neset has surrounded himself with jazz’s finest – Ivo Neame (piano/keyboards); Jim Hart (vibes); Jasper Høiby (bass) and Anton Eger (drums). Add to this an accomplished gathering of brass players – along with Bjarke Mogensen on accordion, and sister, Ingrid, on flutes – and one begins to understand the scale of this project. Neset takes compositional credits throughout an album of extraordinary variety, complexity and maturity – one which is exceptionally well balanced and produced. The title track implies an energetic, ‘avian conversation’ of squawks, chirps, tweets and calls, all building from a single note beginning. As this near-eleven-minute opener establishes itself, the saxophone comparisons with Wayne Shorter and Michael Brecker become clear, as do the creative and rhythmic influences of Neset’s legendary mentor, Django Bates. It’s elaborate stuff, demanding much from each musician, before concluding with a lyrical flute coda which then merges into the marvellously distant, brass-sustained ‘Reprise’. ‘Boxing’, complete with commentator, crowd and ‘seconds out’ bell, has the quintet bounding around the canvas, none of the players pulling any punches. Jim Hart’s vibes shine, in conjunction with the always excellent piano of Ivo Neame, whilst Høiby and Eger thrash things out as only they can! Melodically and rhythmically, it’s a tour de force (with a cheeky ‘knockout’ finish!). That contrast mentioned earlier is typified by an elegant transition into ‘Portuguese Windmill’, Marius then picking up the tempo on soprano, eventually leading into a beautiful, lyrical interlude from Neame. The appropriately-named ‘Spring Dance’ follows as a sprightly tenor and flute duet – to my ears, evoking Milhaud or Poulenc – and given a characteristically precise, percussive edge by Anton Eger. The Brecker-like ‘Field of Clubs’ drives along with a bright demeanour, suggesting all the memorability of a TV theme tune, before free-falling into the dreamy ‘The Place of Welcome’. Neset deftly displays, in writing and playing, his understanding of light and shade with this calming episode: Høiby’s recognisable and appealing bass to the fore; vibes and keyboards adding to the feel-good. Finally, a rallying curtain call from ‘the Birds’, heralded and maintained by Eger’s snare: ‘Fanfare’, a triumphant, upbeat and folksy closing number from an extraordinary collective. All that’s missing, after the big finish, is your applause! Another superbly-produced masterpiece from pioneering British label, Edition Records, proclaiming as always the creativity, originality and energy bursting out of the current contemporary jazz scene.